For the past 12 years, through rocky times that included falling into receivership in 2007 and recovery under new owners, Jennifer Kandarian has worked at Books on the Square in Providence. For many independent bookstores, matching the tomes they stock with the community is an art. That was especially true, they say, in the cash-strapped years following the Great Recession. And it continues through the ongoing challenges of big-box retailers, Kindle and online giants such as Amazon.com. Finding ways to cultivate a loyal following with personal attention, hard-to-find titles and in some cases inventory that goes well beyond books, more than a dozen independent booksellers across the state have managed to compete by staying connected to the communities they serve. 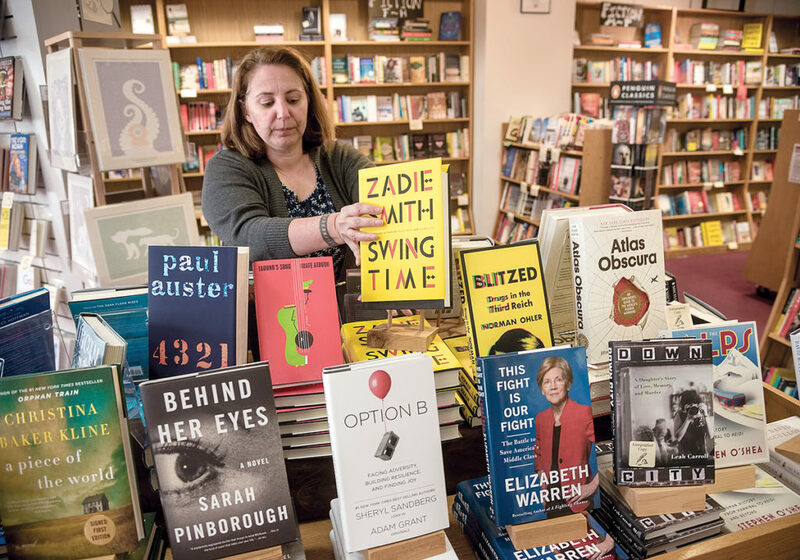 “Not only are we surviving the economic challenges of the past few years, we’ve been thriving,” said Barrington Books General Manager Jennifer Massotti. The 31-year-old store began in 1986 as a Little Professors chain and was purchased by the current owners in 2008. The company’s outlook on future business prospects was positive enough to open a second location in Cranston in October 2015. The company, she explained, wanted “an area that had ample foot traffic, parking, synergistic retail offerings – more of a shopping destination” and they found their match in Cranston’s Garden City Center, she said. But weren’t printed books, along with newspapers and other supposed 19th-and 20th-century relics, supposed to all but disappear under the pressure wrought by new technology and reading habits? The Association of American Publishers reported a 6.5 percent increase in paperback sales revenue, 2.2 percent jump in hardcovers and a 29.1 percent leap in downloaded audio between January and November 2016 and the same period in 2015. Conversely, eBook sales fell by 16.4 percent, according to the national organization. In 2015, the publishing industry saw a 37.6 percent increase in sales for downloaded audio, a 2.8 percent bump in paperback sales and hardcover sales increased by 8.3 percent. Sales of eBooks declined 11.3 percent in 2015. 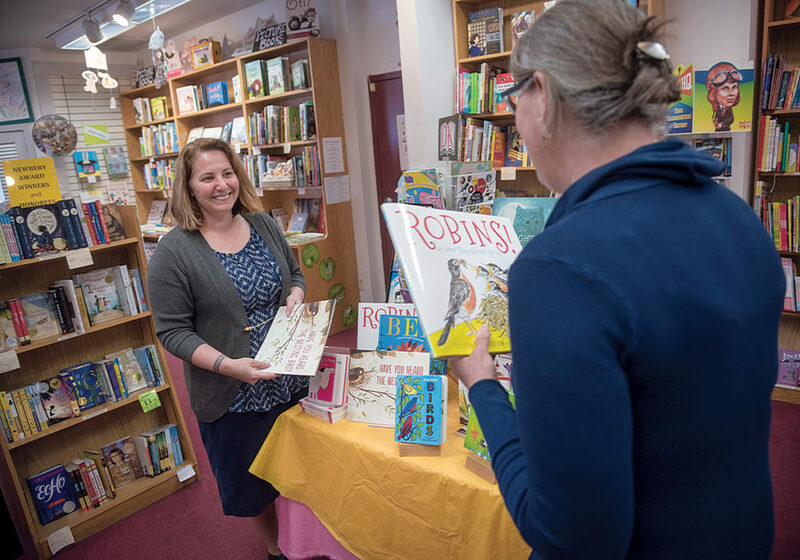 The American Booksellers Association and New England Independent Booksellers Association represent 14 independent bookstores in the Ocean State – including two college bookstores. Comparatively, Massachusetts is home to 104 independent bookstores, according to the ABA and NEIBA membership logs. 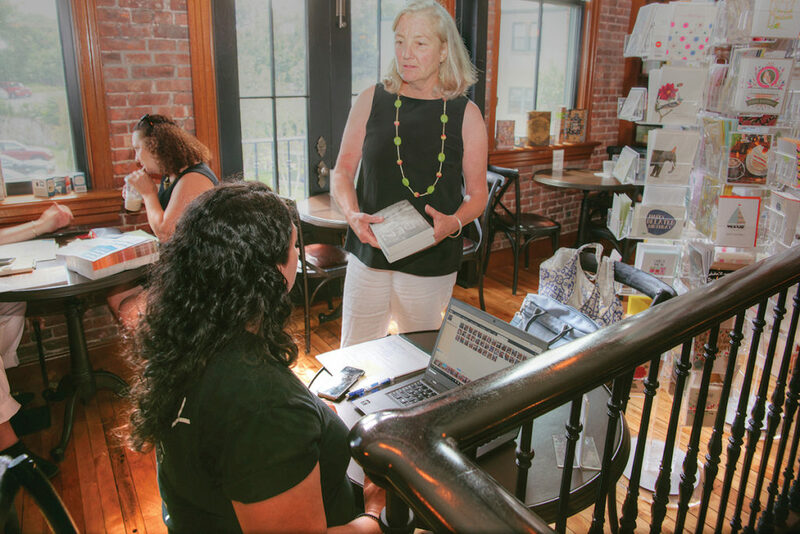 Seven of Rhode Island’s independent bookstores are represented by NEIBA, which does not collect industry-specific budget or sales data from any of its 153 total members in Connecticut, Maine, Massachusetts, New Hampshire, New York, Rhode Island and Vermont. Based in White Plains, N.Y., the ABA represents independent bookstores, holds national conferences and collects data on the industry. While the ABA tracks members’ sales, rent and payroll data and presents it for comparison so an independent bookstore in Rhode Island can see how they measure up nationally, the organization declined to share the data with Providence Business News. ABA data available to the media includes the number of members from 2009 to 2016 that shows a steady increase. In 2009, the organization represented 1,401 companies at 1,651 locations, and last year had grown to encompass 1,775 companies at 2,311 locations. It does not track Rhode Island-only data. Though their numbers are limited in Rhode Island, after some shaky years independent booksellers are growing increasingly confident they can co-exist with the industry’s biggest and newest players. “The advent of Amazon and Kindle had its impact, but we don’t feel that threat now because our … customer base makes a conscious decision to shop local,” said Massotti. “You can’t replace that impulse buy” from browsing shelves and in-store displays. Books on the Square, an ABA member that specializes in fiction, children’s books and stationery, is a unique example of how an independent bookstore survived the Great Recession. First opened in 1992, the Providence-based shop fell into receivership in 2007 before getting a second chance with new owners Rodney and Mercedes Clifton. Before the new owners stepped in, “It was such a time of uncertainty. No one knew if the bookstore was going to stay, but the community wanted us to remain,” Kandarian said. The reason, says Kandarian, is the shop’s long history of connecting with its customer base. Company data shows Books on the Square’s annual budget has slowly risen, with mostly single-digit percentage gains under the new owner. The highest jump since 2007 was 16 percent in 2011-2012, which Kandarian attributes to a computer-software upgrade allowing employees to track the availability of out-of-stock titles. “Our special orders … exploded when we were able to say, ‘we can get that in three days,’ ” she said. The annual budget for the shop, which sells a mix of Rhode Island history first-editions, art, architecture and math books, is down, he said, estimating last year’s annual budget as between $200,000 and $300,000 – “one-third less” than in 2008. “We wouldn’t be here without the internet,” he said. Besides selling used books, what sets Chandley apart is his decision to list half his inventory – roughly 25,000 books – through online platforms, including an Amazon shop. However, the “customer-first” ­approach of Amazon – which Chandley calls “the evil empire” – has made for a prickly bedfellow. Chandley recounted multiple times when customers claimed not to receive a book, thereby receiving a refund, which Amazon deducted from his profits. “A small store like this is pretty much powerless against a behemoth like Amazon,” he said. Rather than grasp the “evil empire’s” coattails, Middletown’s Island Books owner Judy Crosby has dabbled in eBook sales through the store’s website. 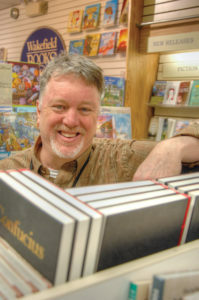 While Chandley lists half his inventory online, Crosby said for Island Books, an ABA general bookstore specializing in fiction, biography and history, online sales aren’t top priority. The biggest hurdle Crosby said she faced competing with online sellers was when Amazon wasn’t paying sales tax. She paints an egalitarian image of the local industry. That in mind, her outlook for independent bookstores in the Ocean State is positive as new blood gets involved. “Bookstores are being sold to younger owners as people look to retire, and there were many years that didn’t happen,” she said. Bob Ryan’s career in independent bookstores mirrors many of the challenges faced by the industry over recent decades. His 2011 decision to purchase Wakefield Mall-based Walden Books in South Kingstown, a Borders affiliate where he was employed, is reminiscent of how the Cliftons stepped forward to purchase Books on the Square in 2007. “We knew we couldn’t let this town go without a bookstore,” he said. Describing each independent bookshop as “their own unique animal,” Ryan appreciates how online sales work for other shops but said he doesn’t participate. Instead, he prioritizes in-store experiences and attracting repeat customers. “Without the internet, I’m sure we would do better,” Ryan said. He declined to share annual budget data, but remembers one particularly good summer when copies of Gillian Flynn’s “Gone Girl” were flying off the shelf. “With the right combination of good weather and good titles, we can do really well,” Ryan said. 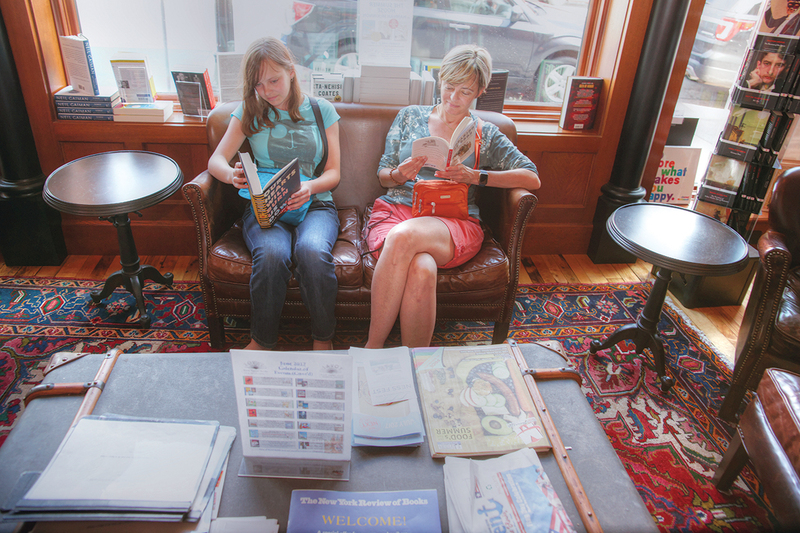 While summer and beachgoers looking for light reads can boost business, local booksellers don’t count heavily on tourists to make or break their years. But visits from high-profile officials and celebrities, no matter the season, can help the bottom line, says Annie Philbrick, owner of Westerly-based Savoy Bookshop & Café. After the 2016 presidential election last November, former President Bill Clinton, former first lady and Democratic presidential candidate Hillary Clinton, their daughter Chelsea and her family were spotted browsing the shop’s shelves. Gov. Gina M. Raimondo, as well as U.S. Sen. Jack F. Reed have shopped there, she said. For adult readers not looking for toys or stationery, but a public forum to learn about current events and participate in community discussions, there will soon be Riffraff. Half bar, half independent bookstore touting a curated collection of fiction, art and independent press publications, Riffraff is slated to open in Providence in September. The decision to devote half the store to liquor sales came down to the need to turn a profit. “The gritty truth of the matter is bookstores – even the best of them – struggle to make money because the profit margin on books is not great,” said Roberge. In addition, coming from careers in New York City’s publishing and bookselling industry, both Roberge and Ramadan think Riffraff will attract a different customer because it will stay open until midnight. Because they maintain a positive outlook on the industry and believe there is a resurgence in – as Ryan put it – “real book” readers, Riffraff’s owners hope to recommend other independent bookshops, in the same way hotels promote local restaurants. “People are starting to revolt against the idea that everything should be happening online … [and] this is a good sign,” said Ramadan.